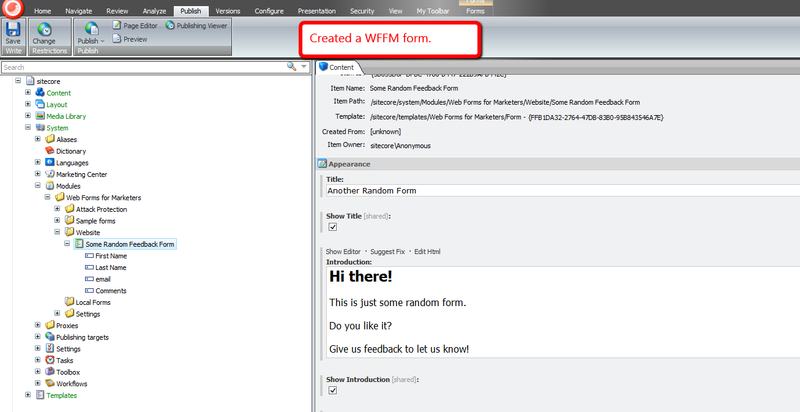 This past weekend I noticed the <formUploadFile> pipeline in Web Forms for Marketers (WFFM), and wondered whether I could create an alternative solution to the one I had shared in this post — I had built a custom WFFM field type to prevent certain files from being uploaded through WFFM forms. The class above adds restricted MIME types to a list — these MIME types are defined in a configuration file shown below — and checks to see if the uploaded file’s MIME type is in the restricted list. If it is restricted, an exception is thrown with some information — throwing an exception in WFFM prevents the form from being submitted. MIME types are inferred using System.Web.MimeMapping.GetMimeMapping(string fileName), a method that is new in .NET 4.5 (this solution will not work in older versions of .NET). In case you are wondering, the MIME type being passed to the processor in the configuration file is for executables. If you know of another way to determine MIME types on Sitecore.Form.Core.Media.PostedFile instances, or have other ideas for restricting certain files from being uploaded through WFFM, please share in a comment. 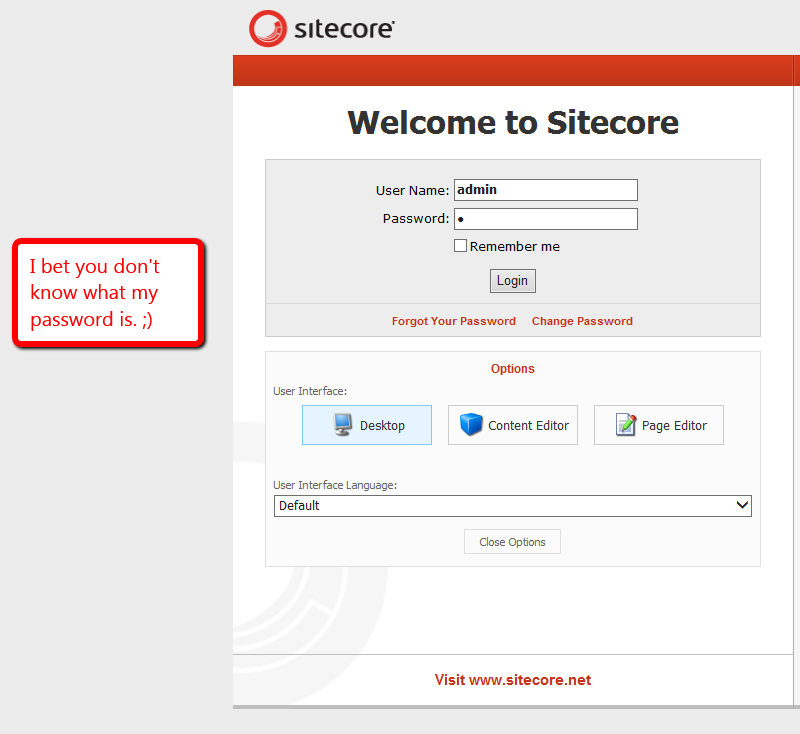 Last week my friend and colleague Greg Coffman had asked me if I knew of a way to restrict IP access to directories within the Sitecore web application, and I recalled reading a post by Alex Shyba quite some time ago. The pipeline processor above determines whether the IP making the request has access to the directory or file on the file system — a list of IP addresses that should have access are passed to the pipeline processor via a configuration file, and the code does check to see if the requested URL is a directory or a file on the file system — by matching the beginning of the URL with a configuration defined root path. If the user does not have access to the requested path, s/he is redirected to the “No Access Url” which is specified in the Sitecore instance’s configuration. Since my IP is 127.0.0.1, I decided to only allow 127.0.0.2 access to my Sitecore directory — this also includes everything within it — in the above configuration file for testing. If you have any thoughts on this, or know of other solutions, please share in a comment. Last week I took notice of a SDN forum post asking whether there are any best practices for checking files uploaded into Sitecore for viruses. Although I am unaware of there being any best practices for this, adding a processor into the <uiUpload> pipeline to perform virus scans has been on my plate for the past month. Not being able to find an open source .NET antivirus library has been my major blocker for building one. However, after many hours of searching the web — yes, I do admit some of this time is sprinkled with idle surfing — over multiple weeks, I finally discovered nClam — a .NET client library for scanning files using a Clam Antivirus server (I setup one using instructions enumerated here). Before I continue, I would like to caution you on using this or any antivirus solution before doing a substantial amount of research — I do not know how robust the solution I am sharing actually is, and I am by no means an antivirus expert. The purpose of this post is to show how one might go about adding antivirus capabilities into Sitecore, and I am not advocating or recommending any particular antivirus software package. 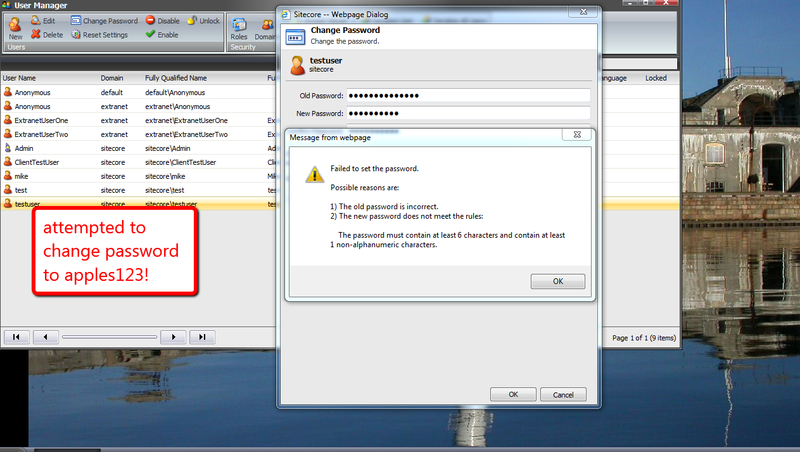 Please consult with an antivirus expert before using any antivirus software/.NET client library . This interface defines the bare minimum methods our antivirus classes should have. Instances of these classes should offer the ability to scan a file through the file’s Stream, or scan a file located on the server via the supplied file path. I used the ClamScanResults enumeration as a model for the above. I created and used the ScanResultType enumeration instead of the ClamScanResults enumeration so that this solution can be extended for other antivirus libraries — or calls could be made to other antivirus software through the command-line — and these shouldn’t be tightly coupled to the nClam library. 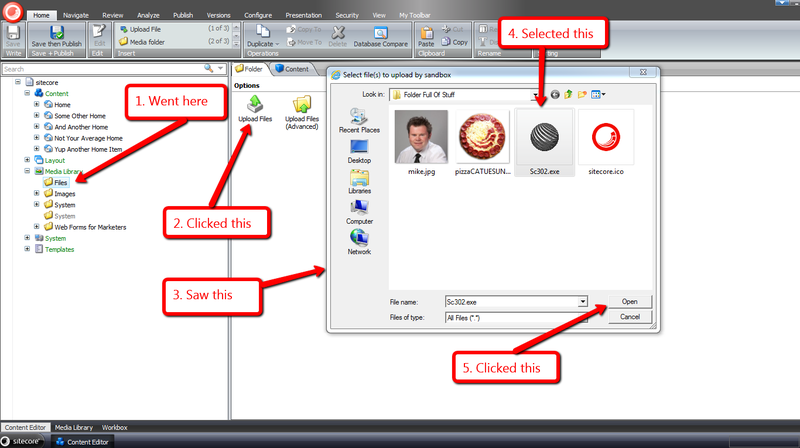 Methods in the above class make calls to the nClam library, and return a ScanResult intance containing detailed information about the file scan. Uploaded files are passed to the IScanner instance, and the pipeline is aborted if something isn’t quite right — this occurs when a virus is detected, or an error is reported by the IScanner instance. 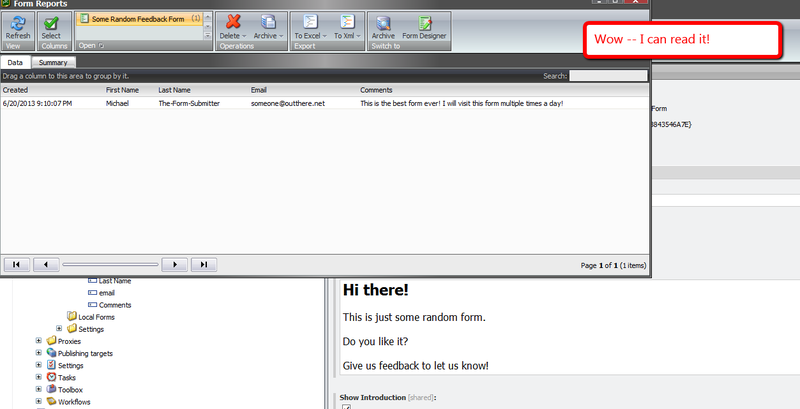 If a virus is discovered, or an error occurs, the message contained within the ScanResult instance is captured in the Sitecore log. 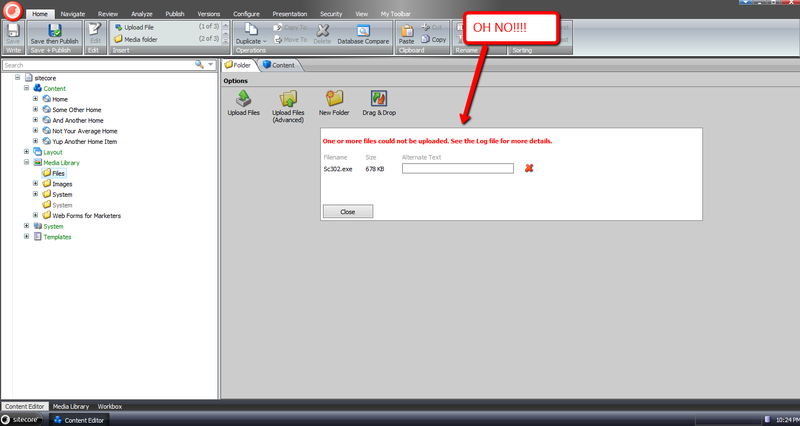 I wish I could show you this in action when a virus is discovered in an uploaded file. However, I cannot put my system at risk by testing with an infected file. If you have any suggestions on making this better, or know of a way to test it with a virus, please share in a comment below. Tonight I was struck by a thought while conducting research for a future blog post: should we prevent users from uploading certain types of files in Sitecore for security purposes? What I’m suggesting is we might want to consider restricting certain types of files — specifically executables (these have an extension of .exe) and DOS command files (these have an extension of .com) — from being uploaded into Sitecore, especially when files can be easily downloaded from the media library. Doing this will curtail the probability of viruses being spread among our Sitecore users — such could happen if one user uploads an executable that harbors a virus, and other users of our Sitecore system download that tainted executable, and run it on their machines. 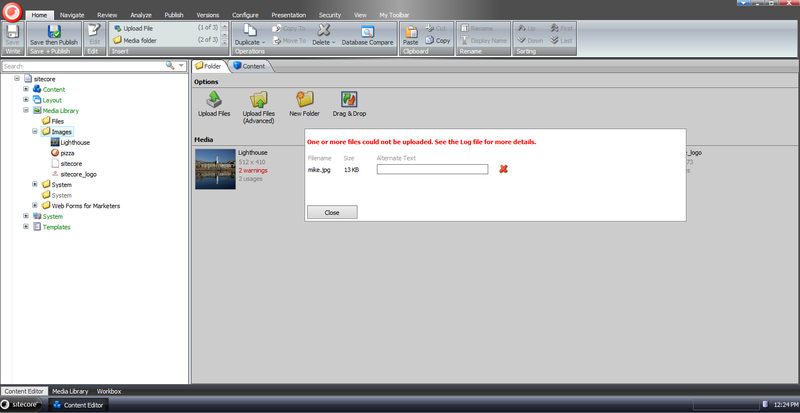 The class above ascertains whether each uploaded file has an extension that is restricted — restricted extensions are defined in the configuration file below, and are added to a list of strings via the AddRestrictedExtensions method — and logs an error message when a file possessing a restricted extension is encountered. If you have thoughts on this, or have ideas for other processors that should be added to uiUpload pipeline, please share in a comment. In an earlier post, I walked you through how I experimented with data encryption of field values in Sitecore, and alluded to how I had done a similar thing for the Web Forms For Marketers (WFFM) module on a past project at work. Months have gone by, and guilt has begun to gnaw away at my entire being — no, not really, I’m exaggerating a bit — but I definitely have been feeling bad for not sharing a solution. In order to shake feeling bad, I decided to put my nose to the grindstone over the past few days to come up with a different solution than the one I had built at work, and this post shows the fruits of that labor. As I had mentioned in my previous post on data encryption, I am not a cryptography expert, nor a security expert. I am not aware of how strong the RC2 encryption algorithm is, or what it would take to crack it. I strongly advise against using this algorithm in any production system without first consulting with a security expert. I am using it in this post only as an example. If you happen to be a security expert, or are able to compare encryption algorithms defined in the System.Security.Cryptography namespace in mscorlib.dll, please share in a comment. The above class employs the decorator pattern. An inner WFFM Data Provider — which is supplied via a parameter configuration node in \App_Config\Include\forms.config, and is created via magic within the Sitecore.Reflection.ReflectionUtil class — is wrapped. 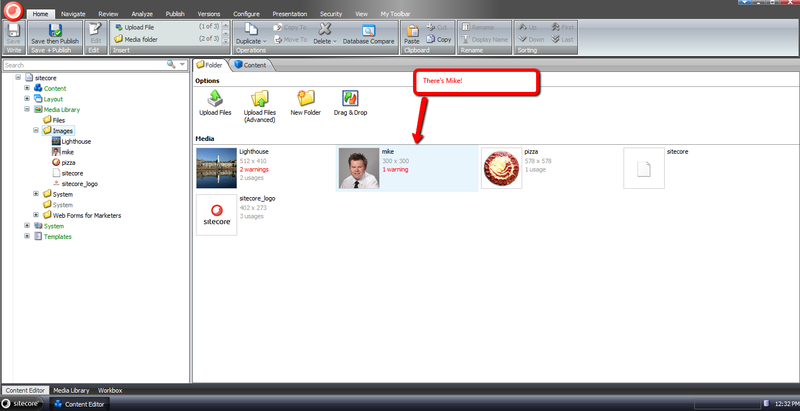 Methods that save and retrieve form data in the above Data Provider decorate the same methods defined on the inner WFFM Data Provider. Methods that save form data pass form(s) — and eventually their fields — through a chain of Encrypt methods. The Encrypt method that takes in an IField instance as an argument encrypts the instance’s field name and value, and returns a new instance of the WFFMField class using the encrypted data and the other properties on the IField instance untouched. Similarly, a chain of Decrypt methods are called for form(s) being retrieved from the inner Data Provider — field names and values are decrypted and saved into a new instance of the WFFMField class, and the manipulated form(s) are returned. I want to point out that the IEncryptor instance is actually an instance of DataNullTerminatorEncryptor — see my earlier post on data encryption to see how this is implemented — which decorates our RC2Encryptor. This decorating encryptor stamps encrypted strings with a special string so we don’t accidentally encrypt a value twice, and it also won’t try to decrypt a string value that isn’t encrypted. 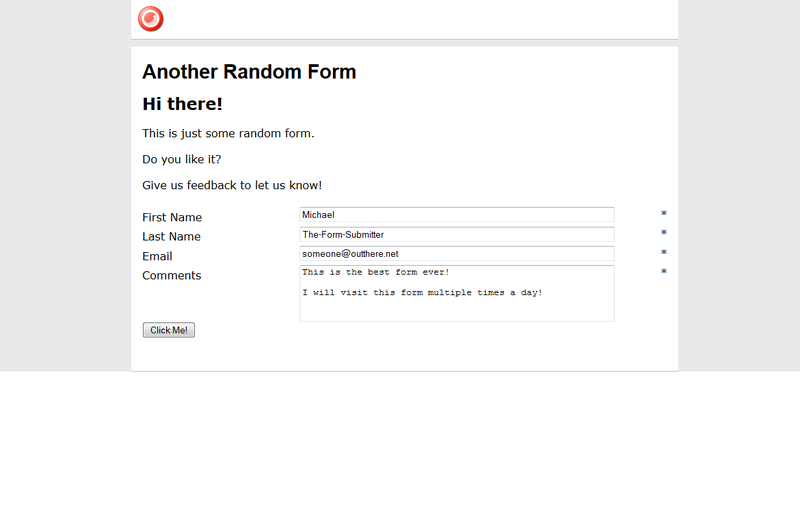 I then mapped the above form to a new page in Sitecore, and published both the form and page. As you can see, the data is encrypted. As you can see, the end-user would be unaware that any data manipulation is happening under the hood. I recently worked on a project that called for a feature to expire Sitecore users’ passwords after an elapsed period of time since their passwords were last changed. The idea behind this is to lessen the probability that an attacker will infiltrate a system — or multiple systems if users reuse their passwords across different applications (this is more common than you think) — within an organization by acquiring old database backups containing users’ passwords. The processor above ascertains whether a user’s password has expired by adding a configured timespan — see the configuration file below — to the last date and time the password was changed, and if that date and time summation is in the past — this means the password should have been changed already — then we redirect the user to a change password page (this is configured to be the Change Password page in Sitecore). If you can think of any other security measures that should be added to Sitecore, please share in a comment. 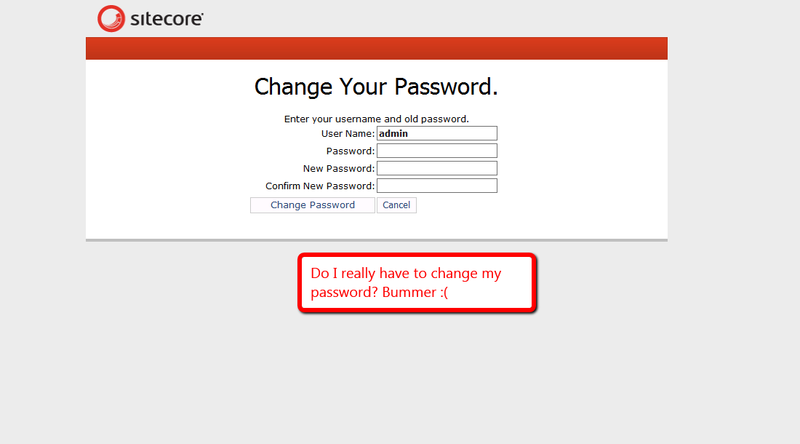 Lately, enhancing security measures in Sitecore have been on my mind. One idea that came to mind today was finding a way to prevent password cracking — a scenario where a script tries to ascertain a user’s password by guessing over and over again what a user’s password might be, by supplying common words from a data store, or dictionary in the password textbox on the Sitecore login page. As a way to prevent users from using common words in their Sitecore passwords, I decided to build a custom System.Web.Security.MembershipProvider — the interface (not a .NET interface but an abstract class) used by Sitecore out of the box for user management. Before we dive into that code, we need a dictionary of some sort. I copied some of the fruits on that Wikipedia page into a patch include config file — albeit it would make more sense to put these into a database, or perhaps into Sitecore if doing such a thing in a real-world solution. I am not doing this here for the sake of brevity. I decided to reuse a utility class I built for my post on expanding Standard Values tokens. In the version of our “checker” class above, I added the option to have the “checker” ignore case comparisons for the source and substrings. Next, I created a new System.Web.Security.MembershipProvider subclass where I am utilizing the decorator pattern to decorate methods around changing passwords and creating users. By default, we are instantiating an instance of the System.Web.Security.SqlMembershipProvider — this is what my local Sitecore sandbox instance is using, in order to get at the ASP.NET Membership tables in the core database. In our MembershipProvider above, we have decorated the ChangePassword() and CreateUser() methods by employing a helper method to delegate to our DictionaryWordsSubstringsChecker instance — an instance of the StringSubstringsChecker class above — to see if the supplied password contains any of the fruits found in our collection, and prevent the workflow from moving forward in changing a user’s password, or creating a new user if one of the fruits is found in the provided password. If we don’t find one of the fruits in the password, we then delegate to the inner MembershipProvider instance — this instance takes care of the rest around changing passwords, or creating new users. I then had to register my MemberProvider in my Web.config — this cannot be placed in a patch include file since it lives outside of the <sitecore></sitecore> element. So, let’s see what the code above does. 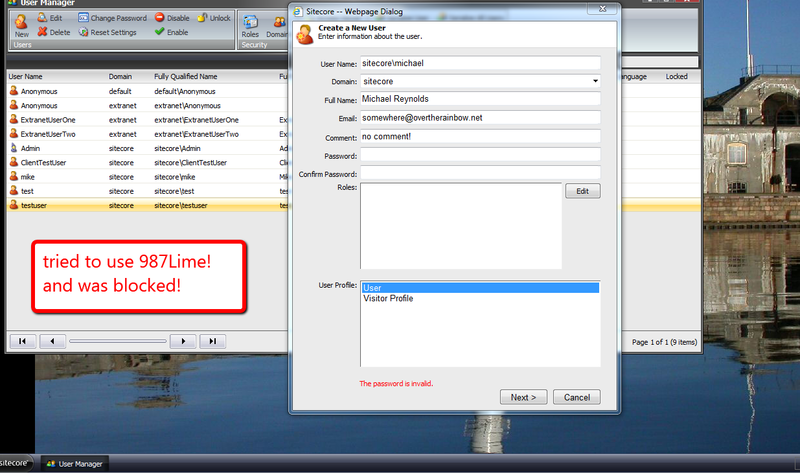 I first tried to create a new user with a password containing a fruit. 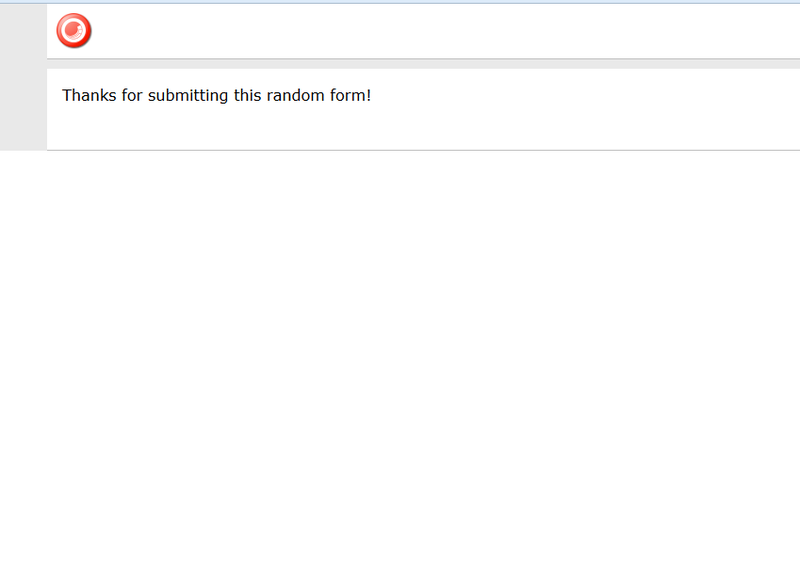 I then used a fruit that was not in the collection of fruits above, and successfully created my new user. 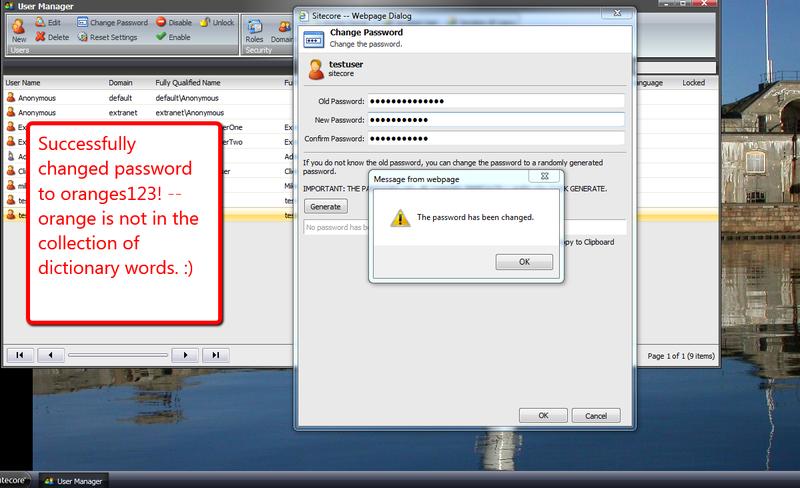 Next, I tried to change an existing user’s password to one that contains the word “apple”. I successfully changed this same user’s password using the word orange — it does not live in our collection of fruits above. And that’s all there is to it. If you can think of alternative ways of doing this, or additional security features to implement, please drop a comment.